So your car or truck has been running great. It’s getting good mileage and the performance is like when it was new. Then all of a sudden it won’t start. You check the battery, the starter and the cables but nothing works. Well, guess what, it just might be the timing belt. You can’t see it and most people don’t know where to look for it. The good people at Elkhart Mechanics know where it’s at and keep change it in no time. Timing belts are inside the engine and can be very difficult to change. They stretch over time and can literally stop the vehicle from running. So get down to Elkhart Mechanics when you don’t know where else to turn and get that timing belt fixed. The purpose of the timing belt is to regulate the timing of the crankshaft, which is responsible for the pistons of the engine, and the camshaft, which is responsible for opening and closing parts. 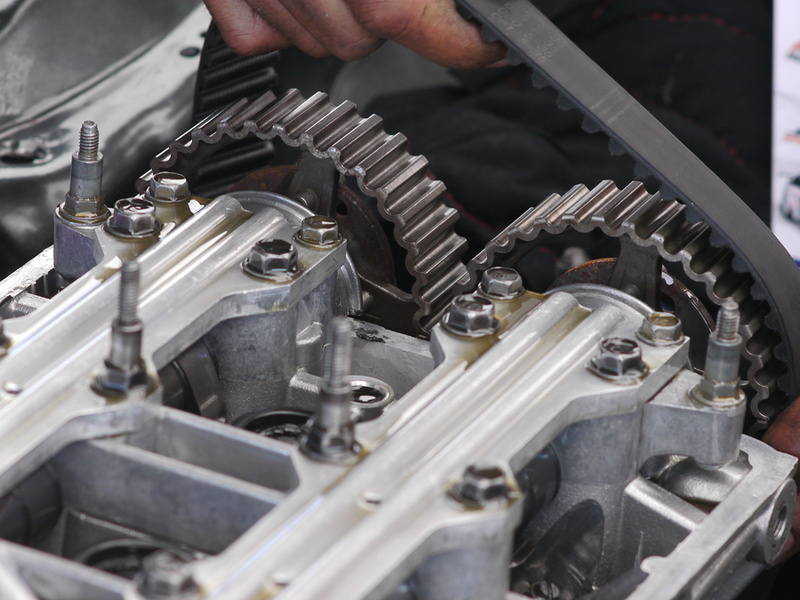 The timing belt runs between the crankshaft and the camshaft and connects them together. Some manufacturers recommend replacing your timing belt after a certain number of miles so that you can install a new one before the old one has a chance to fail, because a timing belt malfunction can cause serious damage to your car’s engine. If a timing belt malfunctions fairly soon after it was installed, there is most likely a problem with another part that caused it to damage the timing belt. It is important to install the timing belt at the correct level of tension. If it is installed too tightly, it will eventually tear. If it is installed too loosely, the teeth may come off or become worn out or hollowed out. Problems with the pulleys can also lead to similar timing belt symptoms, as well as damaging the edges of the belt. Extreme temperatures can cause cracks in the back of the timing belt, as can a worn out back idler. If oil leaks onto the timing belt, that can also cause it to malfunction. Unfortunately, if you don’t bring your car in for regular maintenance, it is easy not to notice these symptoms until they lead to something worse. The only sign of a timing belt problem drivers usually notice is when a timing belt makes noise. The cause of the noise is usually that the timing belt is too tight or too loose. When you bring your car to Elkhart Mechanics for maintenance, we will check your timing belt. We take the utmost care when installing timing belts and all other parts.